This service includes Vespers, with an added Epistle and Gospel, as well as a procession with the Cross. 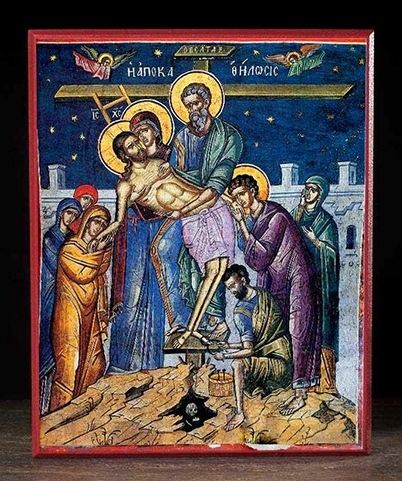 The Descent from the Cross (Greek: Apokathelosis), or Deposition of Christ, is the scene, as depicted in art, from the Gospels' accounts of Joseph of Arimathea and Nicodemus taking Christ down from the cross after his crucifixion (John 19:38-42). In Byzantine art, the topic became popular in the 9th century, and in the West from the 10th century. The Descent from the Cross is the 13th Station of the Cross in the Latin Rite. This service is followed by the Epitaphios Service/Blessed Flowers at 7pm.